Scarlett is from Puebla, Mexico and is a member of the Equal Exchange family. 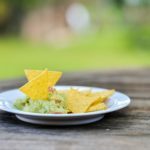 She was kind enough to share her famous guacamole recipe with us! This classic dish is sure to please any party guest. They'll thank you (and Scarlett) the next time you serve it up! Cut avocados in half, remove pit and cut in slices. Detach avocado from peel with spoon and place fruit in a bowl. Pour juice of one lime, garlic, olive oil, salt, and pepper. With a fork smash the avocados until all ingredients are mixed. Mix and taste it, if it needs more lime add the other one and mix again. Take out some corn chips or veggies and get dippin'! Recipe shared with permission from Scarlett de la Vega Ochoa and Equal Exchange.